Dometic is known as supplier of different kinds of products, offering a high quality and high degree of innovation. One of their core products is mini-bars for hotels. Dometic approached Develco to get their communication solution between minibar and desk upgraded. Dometic had developed an innovative intelligent concept where sensors should monitor the content of the mini bar and data forwarded to the reception. The realization of the idea, however, was far from optimal. Mini bars were coupled up with wired Ethernet communication via RS485. This meant extensive costs for installation and maintenance as well as greater risk of fire at the cable-bridge between rooms. Furthermore, data collection from the applied sensor technology was erroneous. Dometic wanted a partially wireless system that reduced costs and risks, had a precise and stable functionality and thus an easier, more effective communication from mini bars to the reception. Wireless data transmission from the minibar to the gateway, however, is a technological challenge, as many hotels have a large – and in terms of area widely spread – number of mini bars installed, making it difficult to ensure wireless coverage. Moreover, it was a requirement that the solution had to meet data security for hotel guests. Develco developed hardware and embedded software that could integrate with existing Ethernet from the gateway to the reception. Develco’s solution implied improved sensor solution, wireless communication based on ZigBee, integration of mini bars that enables communication over long distances and integration with existing RS485 technology. To ensure reliable data transmission, Develco developed a mesh network, in which mini bars act as a link between each other and finally out to a gateway, from which data is sent to the reception. Develco met Dometic’s integrity needs by developing a closed Zigbee network. The physical processes of refilling were facilitated by developing a small universal remote control for service employees. Dometic has got a system that is cheaper, safer and above all – it works. 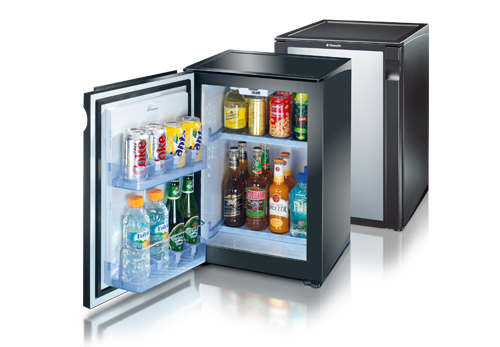 This has given Dometic the opportunity to market a product, which in practice can realize the many benefits of the intelligent mini bar. The hotels can achieve savings related to refilling of mini bars and accurate billing, as the reception has accurate and updated information of consumption. Hotel guests will experience a faster service at check out, but any doubtful individuals must obviously be annoyed about the fact that erroneous information on consumption from the mini bar is not possible in an IoT-universe.